Former New England Patriots player Aaron Hernandez, an explosive tight end who had been convicted of murder and last week cleared in two other killings, was discovered dead in his prison cell by a corrections officer early Wednesday morning. Former New England Patriots player Aaron Hernandez, who was serving a life sentence for murder and just last week acquitted in two other killings, was found dead in his prison cell by a corrections officer early Wednesday morning. He was 27. Hernandez hanged himself with a bed sheet attached to his cell window at the Souza Baranowski Correctional Center in Shirley, Massachusetts, at approximately 3:05 a.m., and was pronounced dead about an hour later at UMass-Memorial Health Alliance Hospital in Leominster, according to a statement from the Massachusetts Department of Correction. He had attempted to block the door from the inside by jamming it with various items, prison officials said. He was in a single cell in a general population unit in the maximum-security state prison. His death is being investigated by Massachusetts State Police and the Department of Corrections. An autopsy will be performed by the medical examiner's office in Boston to determine his cause and manner of death, according to the Worcester District Attorney's Office. Prison officials said they are not aware of any suicide note written by Hernandez and they had no concern that Hernandez might take his own life. 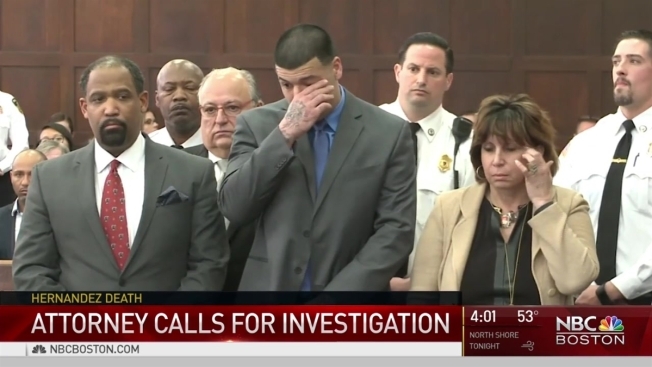 NBC Boston Legal Analyst Randy Chapman explains the legal impact of Aaron Hernandez's death. Last week, Hernandez was acquitted of all but a gun charge in a lengthy trial in the 2012 shooting deaths of Safiro Furtado and Daniel de Abreu. But he was already serving a life sentence without the possibility of parole for his conviction in the 2013 murder of Odin Lloyd, a semi-professional football player who was dating his fiancee's sister. Furtado's father, Salvatore Furtado, appeared publicly with his attorney to react to Hernandez's death. "His reaction, as a Christian, as a person, he never likes for anybody to die," a translator said of Furtado. "He says that only God has the right to take somebody's life, and it's very painful to him when somebody takes his own life." Jose Baez, Hernandez's attorney in the double murder case, said in a statement that Hernandez's family and legal team were "shocked and surprised by the news of his death and will be conducting its own "examination into this tragic event." "There were no conversations or correspondence from Aaron to his family or legal team that would have indicated anything like this was possible," he said. "Aaron was looking forward to an opportunity for a second chance to prove his innocence." John M. Thompson, the attorney handling Hernandez's appeal in the 2013 murder case, also said Hernandez's death should be "carefully and thoroughly investigated." Hernandez's fiancee, Shayanna Jenkins, has not spoken publicly since cameras captured her sobbing in court, overwhelmed with emotions after the jury found him not guilty in the double murder case. 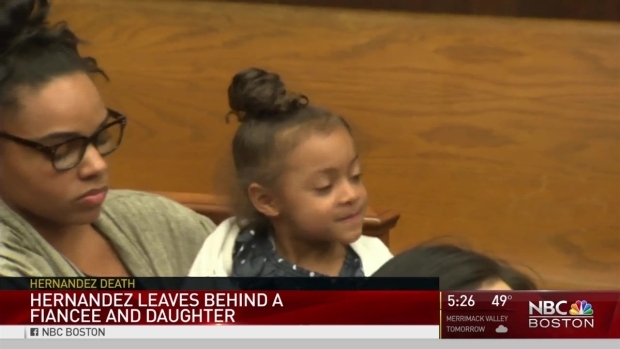 She recently brought their 4-year-old daughter into court, with the tender exchanges between them showing a glimpse into her unwavering support for Hernandez. "I'm sure she's feeling a lot of hurt and pain," said Norman Allard, a neighbor who used to live near Jenkins in North Providence, Rhode Island. Hernandez's death was "a shocking and sad end to a very tragic series of events that has negatively impacted a number of families," added Bristol County District Attorney Thomas Quinn, who prosecuted Hernandez in the Lloyd case. In Dorchester, the Boston neighborhood where Lloyd grew up, a family friend of the Lloyds wondered if the weight of Hernandez's crimes - and of great potential squandered - had finally caught up with him. "I just think it got to him - the guilt," said Mixson Philip, 55. "Each man has to live with himself. You can put on an act like nothing happened, but you've got a soul. You've got a heart. You can't say you don't think about these things. There's no going around that." Miami Dolphins center Mike Pouncey, a college teammate of Hernandez's, said on Instagram: "To my friend my brother! Through thick and thin right or wrong we never left each other's side. Today my heart hurts as I got the worse news I could have imagined." Throughout years of court battles and murder charges, Shaynna Jenkins stood by her fiance, Aaron Hernandez. In Connecticut, where Hernandez was raised, friends were in shock and grieving. "We all cannot believe it," said Alex Cugno, who grew up with Hernandez in Bristol. "Especially after him getting acquitted of the double murder. That was a positive thing in our minds." "I don't believe that he would have killed himself," he added. "It just doesn't add up. It's fishy. It makes you wonder what really went on behind those walls in prison." The Patriots had no immediate comment. Hernandez's death came on the day that the team was visiting the White House to celebrate its fifth Super Bowl victory. Hernandez was found guilty of murdering Lloyd in 2015. But his death could vacate that conviction, according to attorney Randy Chapman, legal editor for NBC Boston and necn. "There is a doctrine that says when a conviction is not final, if somebody dies while the appeal is pending, that the case is then dropped," Chapman said. Aaron Hernandez, who is serving life in prison for the murder of Odin Lloyd, was found not guilty of the murders of Safiro Furtado and Daniel de Abreu. While Hernandez was found not guilty of criminal murder charges in the deaths of Furtado and de Abreu, William Kennedy, an attorney representing Furtado's father, said they will continue to pursue the civil case, which he said carries a lesser standard of proof. "A stay was ordered because of the pending criminal cases, and that stay will expire at the end of this month," Kennedy said. "We intend, at this point, to go forward with the cases." "It's an unusual circumstance, and we would have to prepare carefully before we decide to go about it," said Thompson, Hernandez's lawyer. "But normally, a judgement is vacated if the defendant dies amidst an appeal." He would not give details on a timeline for this process. In the second murder trial, prosecutors said Hernandez opened fire on a car, killing de Abreu and Furtado, because he felt disrespected when one of the men bumped into him and spilled his drink at a Boston nightclub. Hernandez choked back tears as he was found not guilty of the killings in a Boston courtroom on Friday, while relatives of the victims sobbed loudly. Hernandez was born in Bristol, Connecticut, and was a star tight end at the University of Florida. He dropped to the fourth round of the NFL draft because of misbehavior in college. 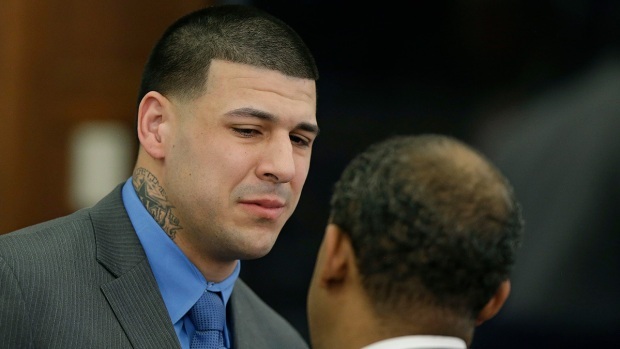 Former New England Patriots star Aaron Hernandez was found guilty of first-degree murder in the deadly late-night shooting of Odin Lloyd, a 27-year-old landscaper and amateur weekend football player. 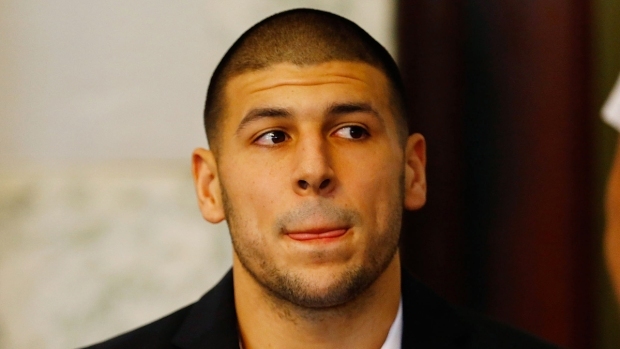 Hernandez was also found guilty on firearm and ammunition charges. In his three years with the Patriots, Hernandez scored 20 touchdowns and appeared in Super Bowl XLVI in 2012. He was arrested before the start of his fourth season in 2013 and released by the team shortly thereafter. SUICIDE PREVENTION HELP: The National Suicide Prevention Hotline (1-800-273-8255) is open 24 hours a day, 7 days a week. Text HOME to 741741 for a Crisis Text Line.